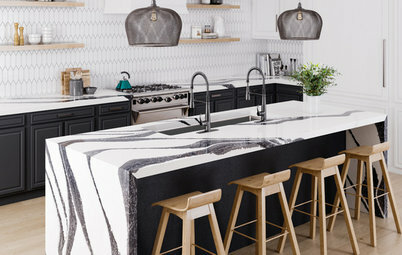 The kitchen of the future was on display at the 2019 Kitchen & Bath Industry Show and International Builders’ Show in Las Vegas in February. 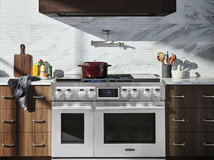 Appliance manufacturers showcased products designed to make the kitchen easier to cook in and help connect household members. Even if you’re not ready to adopt this emerging technology in your own kitchen, you can read on to learn where the industry is headed. One of the major trends we noticed at KBIS and IBS this year was the integration of kitchen appliances with home assistants such as the Amazon Alexa and Google Assistant, among others. 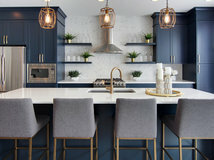 This is a timely development since there has been a definite uptick in homeowners bringing home assistants into remodeled kitchens. 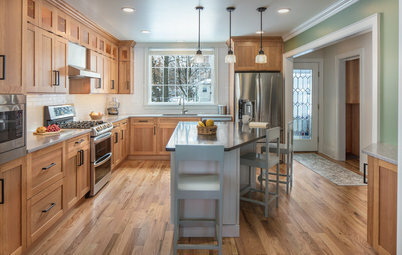 Among homeowners recently upgrading electronics as part of their kitchen renovations, 31 percent added a home assistant, compared with 23 percent the year before, according to the 2019 U.S. Houzz Kitchen Trends Study. 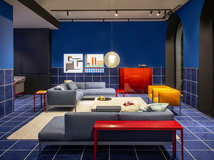 As just one example of this trend, Bosch has integrated its wall ovens, hoods and induction cooktops, as well as its refrigerators and dishwashers, with the open-platform Home Connect app. 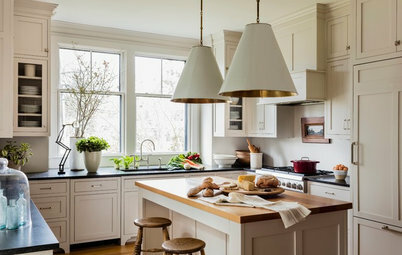 Homeowners can check if their cooktop is on, preheat their wall ovens, monitor the temperature of casseroles in their ovens, get notifications when the meal is ready and more — all remotely from the app. 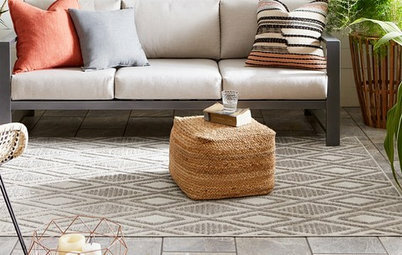 The Home Connect app integrates with Alexa and Google Assistant so that homeowners can do these things through voice commands. 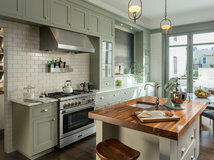 Through Home Connect, homeowners can sync their Bosch cooktops with their Bosch range hoods for automatic deployment when the cooktop is turned on. The Home Connect app can notify homeowners when their fridge or freezer door is open. And when Bosch’s smart dishwasher detects that detergent tabs are running low, the machine automatically reorders detergent through Home Connect’s partnership with Amazon Dash Replenishment. Bosch’s dishwasher even alerts homeowners in case of a leak — and stops operation and pumps water if one occurs. 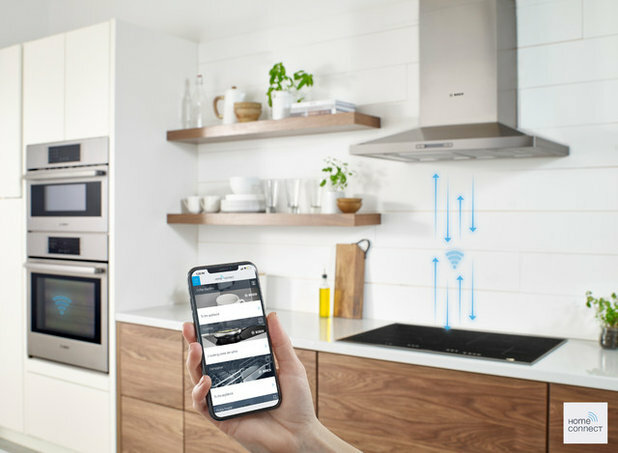 While Home Connect is an open-platform app — Thermador, Gaggenau, Neff and Siemens also use it — several brands have created their own apps for smart kitchen devices. Signature Kitchen Suite’s app can remotely control the brand’s refrigerators, freezers and ovens. Miele and Dacor have apps for their products. And a host of LG products — kitchen, laundry and vacuum cleaners among them — can be controlled through LG’s open-platform SmartThinQ app or by using voice commands through Amazon Alexa or Google Assistant. One natural outgrowth of all this tech coming to the kitchen was seen at the show through improved digital family command centers. GE Appliances showcased its Kitchen Hub, pictured. 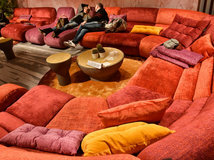 It’s designed to be a family organizing center and control station for the home’s smart devices, as well as a place to stream Netflix while you cook. 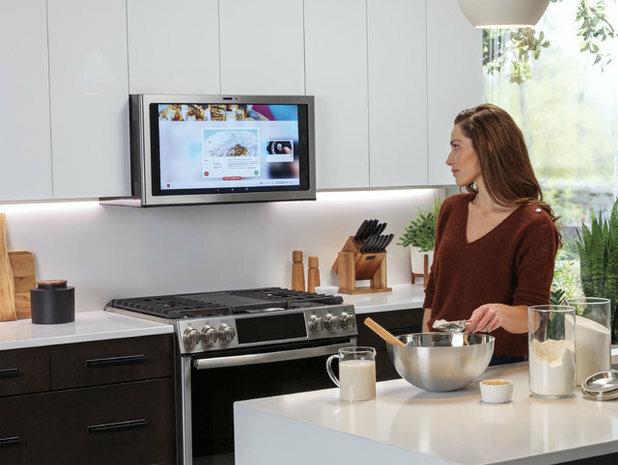 Homeowners can use the Kitchen Hub to pull up calendars and schedules, to access thousands of recipes via the integrated SideChef meal-planning app, and to make video calls while cooking. The hub is designed to be placed above the cooktop and has a ventilation system that protects it from heat, steam and grease. 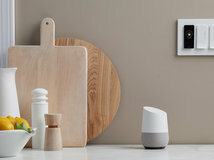 Though the product was debuted at the Consumer Electronics Show in 2018, new this year is its integration with Google Assistant. 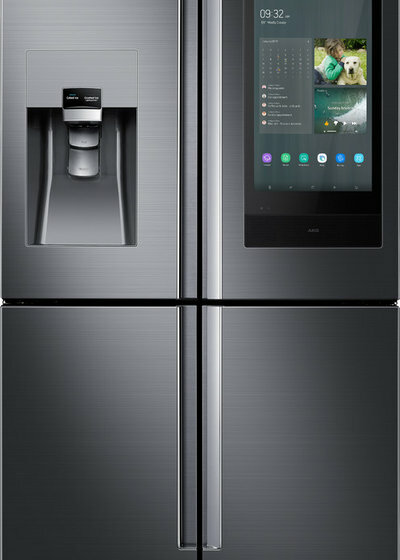 Samsung debuted a new model of its Family Hub refrigerator with a new digital bulletin board where homeowners can write digital sticky notes, place digital photos or doodle directly on the screen. A view-inside feature allows homeowners to see inside their fridges from their smartphones — a useful feature when you’re at the grocery store and can’t remember if you need more milk. The Family Hub integrates Bixby, Samsung’s home assistant, which homeowners can use to ask for a weather report, call a Lyft or control other smart devices with voice commands. 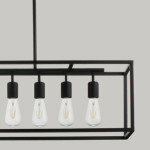 They also can control the home’s connected devices through the refrigerator screen itself. As nice as a digital command center might be, sometimes what you really need is a faucet that can turn itself on or off when your hands are grimy from raw chicken. 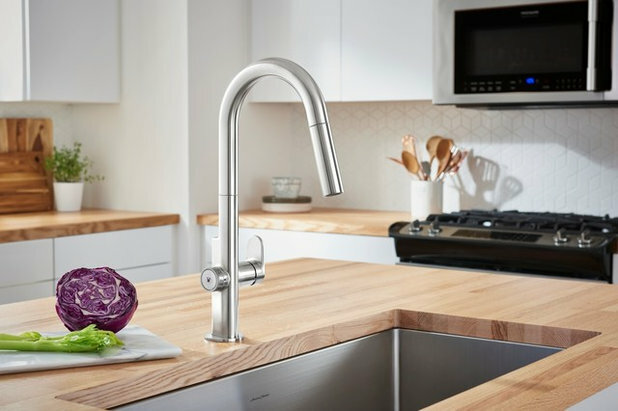 Enter the Kohler Sensate faucet with Kohler Konnect, pictured, and the Delta Trinsic pull-down faucet with VoiceIQ — two products you can turn on or off with voice commands thanks to integration with Amazon Alexa and Google Assistant. With both faucets, you can tell the device to fill your coffeepot, and it will emit the (preprogrammed) proper amount. 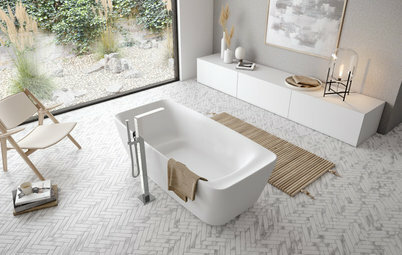 Delta’s Trinsic line has a touch on-off function, meaning that a simple touch of the hand or wrist turns the faucet on or off, while Kohler’s Sensate has a touchless on-off sensor, so a wave of the hand will do the job. 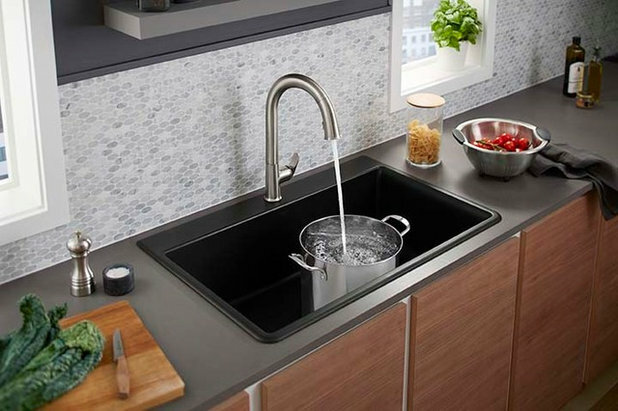 For those who like the idea of a sink dispensing a specific amount of water but aren’t interested in home assistants, American Standard showcased its Beale MeasureFill Touch kitchen faucet, shown in this photo and introduced at KBIS in 2018, which has a hand dial marked with measurements ranging from a half-cup up to 5 cups. Homeowners can turn the dial and walk away, and the faucet will dispense the exact amount selected. A cool new product is Grohe’s Blue Chilled & Sparkling 2.0 faucet, which eliminates waste from purchasing bottled water. A push button on the faucet dispenses chilled, filtered water or, if you prefer, sparkling water powered by a carbon dioxide tank installed beneath the sink. The faucet is Wi-Fi- and Bluetooth-enabled so that homeowners can track carbon dioxide usage and filter status on the Grohe Ondus app. Stove innovations debuted at the shows help homeowners cook their food with greater precision. 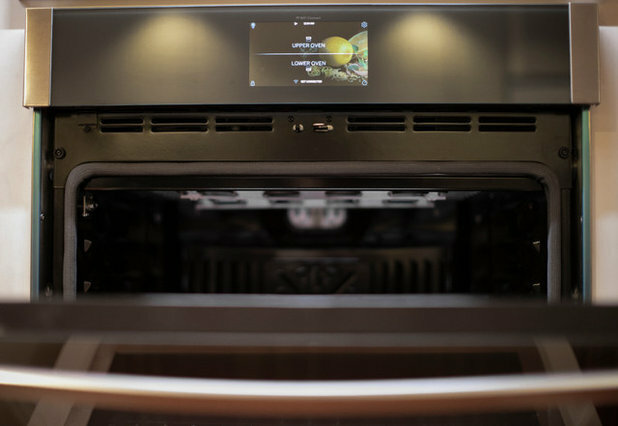 Signature Kitchen Suite added a 36-inch dual-fuel pro range with a built-in sous vide cooker after debuting a 48-inch version with the industry’s first built-in sous vide cooker, pictured, last year. Sous vide is a cooking technique in which food is placed in a food-grade plastic pouch or glass jar and submerged in a water bath at a low temperature for a long period of time, and it allows for precise temperature control. The technique preserves flavor and can help home chefs avoid overcooking meat. The 48-inch cooktop has two induction surfaces that can be used with a griddle, teppanyaki plate or large cookware. It combines an 18-inch steam and convection oven, shown on the left, with a standard 30-inch oven, shown on the right. 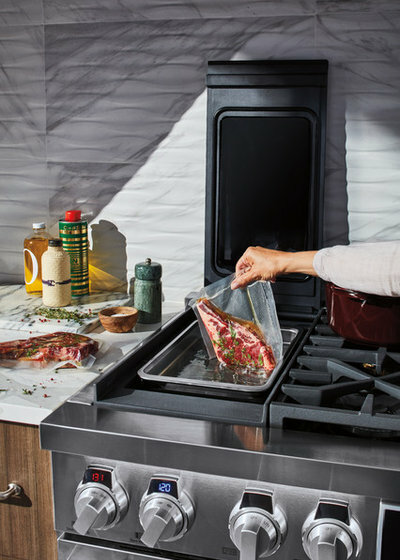 The 36-inch gas model comes in a variety of arrangements, including sous vide with four burners and griddle with four burners. Here’s a closer look at the built-in sous vide portion of the cooktop. The 36- and 48-inch ranges are Wi-Fi-enabled. Homeowners can control them remotely — preheat the oven, for instance — through the Signature Kitchen Suite app. 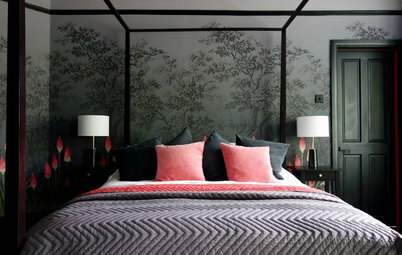 Signature also gives customers the option to enroll in a concierge service with Wi-Fi monitoring. 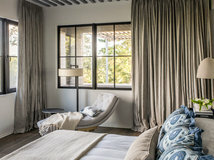 The program offers a third year of warranty free, and the company can proactively notify enrolled homeowners when their products need replacement or repair. 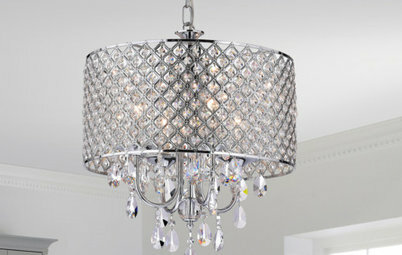 The company has repair people on call 24/7 and promises completed repairs within 24 to 48 hours. 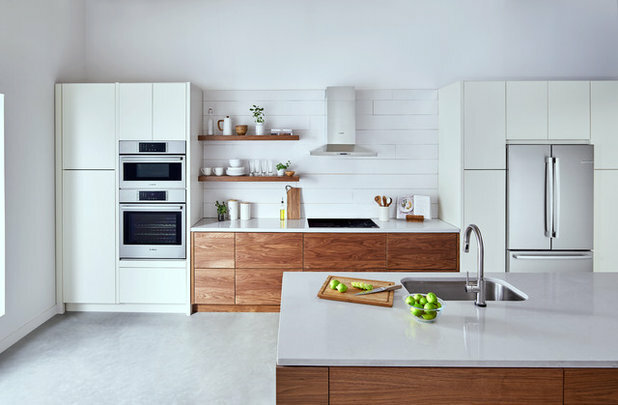 Another cool cooking innovation at the show was GE Appliances’ new air-frying and dehydrating modes for the Café and GE Profile lines of built-in wall ovens (one model is shown in this photo). This new development is really GE responding to consumer demand — about 4 million stand-alone air fryers were sold over a recent 12-month period in the U.S., according to the NPD Group, Consumer Reports reported in January. Homeowners who choose the new wall ovens won’t need to buy stand-alone air fryers — or, for that matter, stand-alone dehydrators — as they can use GE’s air-frying mode to make homemade french fries, chicken wings, jalapeño poppers and more. The benefit of air frying is getting the taste — or close to it — of fried food without the health hazards associated with deep frying. Air frying works with just a thin coating of the oil on food; the machine (or, in this case, the oven) blows hot air that cooks the food. 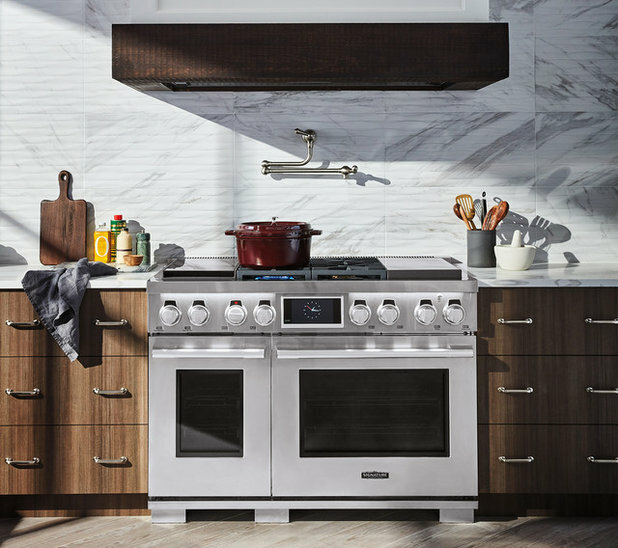 Other manufacturers debuted new cooktop and oven features that bring more power and precision to meal prep. 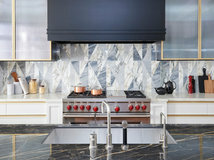 Dacor introduced its new 30- and 36-inch Heritage pro ranges with five induction cooking zones, compared with the typical four. The five zones can operate concurrently without increasing electrical requirements, and the cooktop’s Boost mode can increase the output of a single cooking element by up to 3,700 watts. Bosch’s FlameSelect technology for gas cooktops, available this year for the first time in the U.S., combines the benefits of a gas cooktop with the precision of an electric one. Homeowners can dial through nine pre-defined, precise levels of power to get the exact heat and flame level they want, without monitoring the height of the flame. And for those who are too busy to prep meals, LG’s smart ovens now integrate with the Tovala meal-delivery system. Homeowners can scan the meal’s bar code with the Tovala app, and LG’s smart ovens will heat the Tovala meal appropriately. LG’s smart ovens integrate with other kitchen planning and cooking apps like Innit, SideChef and Drop. Users can select meals from recipes available on these apps and have the exact cooking instructions sent to their LG oven or cooktop. 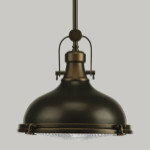 For the wine connoisseur, KBIS revealed some exciting developments in wine storage. 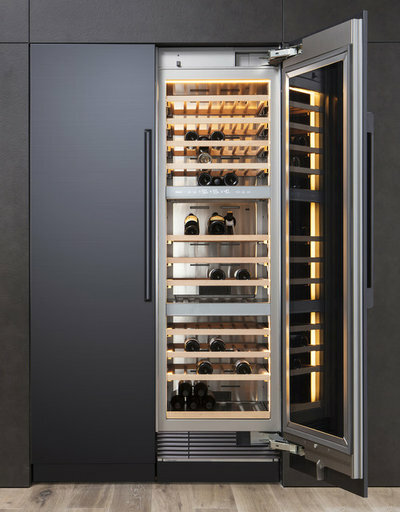 Dacor’s new 24-inch wine cellar, pictured, holds up to 100 bottles in three independently cooled zones. Each zone has its own sensor to keep the humidity in the ideal 50 percent to 80 percent range, and cooling technology limits temperature fluctuations to just three-tenths of a degree Fahrenheit so that the wine stays at the desired chill level. 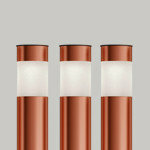 Anti-vibration mounts keep the wine from jiggling, and an air purification system prevents cork contamination. Homeowners can catalog their wines through Dacor’s IQ Connect app, so they know exactly where their favorite bottle is located within the fridge. Signature Kitchen Suite debuted new wine refrigerators along with an app designed to act as a virtual sommelier to help collectors manage their wine. The brand’s True Sommelier app learns a homeowner’s preferences and makes wine recommendations for food and beverage pairings based on the wines stored in the cellar. 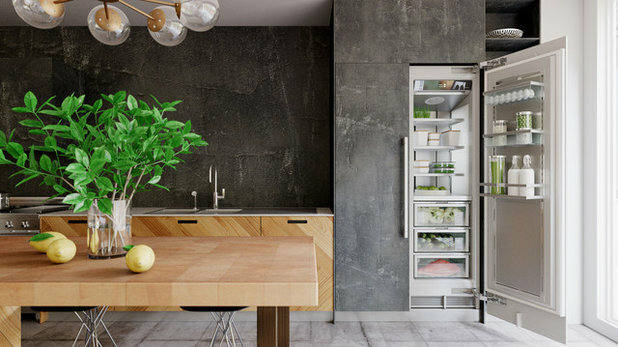 Similar to the Dacor cellar, Signature Kitchen Suite’s wine refrigerator has technology designed to minimize vibration and temperature fluctuation, and it has three independent temperature zones. Homeowners can simply tap on the face of the wine refrigerator door to see what’s inside. Another neat kitchen product slated to roll out and featured at KBIS is LG’s HomeBrew, pictured, the industry’s first capsule-based craft beer maker. Homeowners would use it to make beer by placing four capsules containing malt, yeast, hop oil and flavoring into the machine and pressing start. The HomeBrew makes an American IPA, an American pale ale, a full-bodied English stout, a Belgian-style witbier and a Czech Pilsner, with more beers to come down the road. 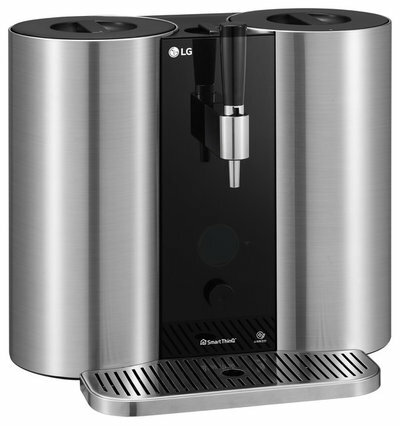 This smart machine can be controlled remotely using LG’s SmartThinQ app or through voice commands and a home assistant. 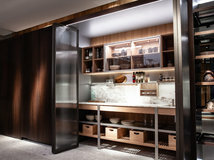 And in a nod to homeowners who are not convinced of the value of being connected, appliance maker Liebherr pointed out that its new 36-inch-wide Monolith column refrigerator, pictured, has the option for Bluetooth or Wi-Fi connectivity. In other words, homeowners can choose not to connect. 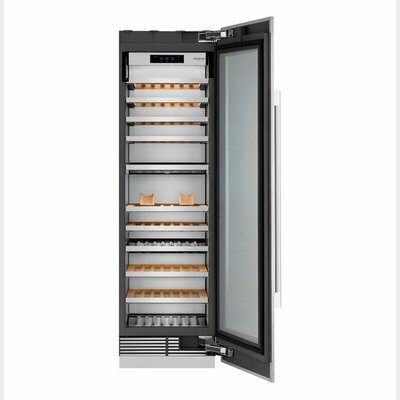 The fact that Liebherr positioned this as a selling point indicates that the brand is considering consumers who would rather not have connectivity in their kitchens at all. Tell us: Would you consider any of these features in your kitchen?Do you already use home assistants and apps for cooking? Share your thoughts in the Comments. Yes, but are they the new "replace in seven years" because they stop working appliances? We currently have a 1989 Whirlpool dishwasher and a 2007 Jenn-Air Convection Oven with down vent. Guess which one hasn't broken down yet? And which has had the control pad replaced twice, the probe stopped working in 2012, the knobs have had to be replaced because the finish burns off (4 times now at $55/a set)... And due to the design of the kitchen, with the venting downward, guess who is the only manufacturer of a down vent oven? Guess how much this $1750 oven now runs, if you can find one? 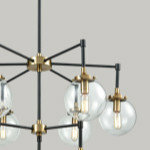 About $4000. Must be nice. My 2002 Kitchenaide gas cooktop and oven - not expensive to begin with- are both working perfectly, and other than the ice maker, the fridge is too. There have been minor repairs over the years, but I'm sure in no hurry to replace them with overly-complicated, overpriced, new appliances! Gary, my Whirlpool dishwasher bit the dust one week after the warranty expired. With what it cost to repair (it needed a new motor), we bought a new KitchenAid dishwasher that was still going strong when we replaced it after 15 years when we remodeled (except for all the plastic/was coming off the trays). We replaced it with a Bosch. The Bosch in our Lakehouse was installed in 1996. We have repaired it once.